Human immunodeficiency virus type 1 (HIV-1) productively infects only humans but not Old World monkeys such as cynomolgus macaques (CMs), whereas simian immunodeficiency virus (SIV) can efficiently replicate in the latter. This species barrier makes it difficult to develop suitable animal models for HIV-1 infection. In this point of view, a monkey-tropic HIV-1 (HIV-1mt) will be a promising model because HIV-1mt productively infects macaque monkeys. In this study, we show for the first time that a polymorphism in the CM TRIM5 gene, which encodes one of the intrinsic anti-retroviral cellular factors, primarily influences inter-individual diversity in terms of susceptibility to HIV-1mt. 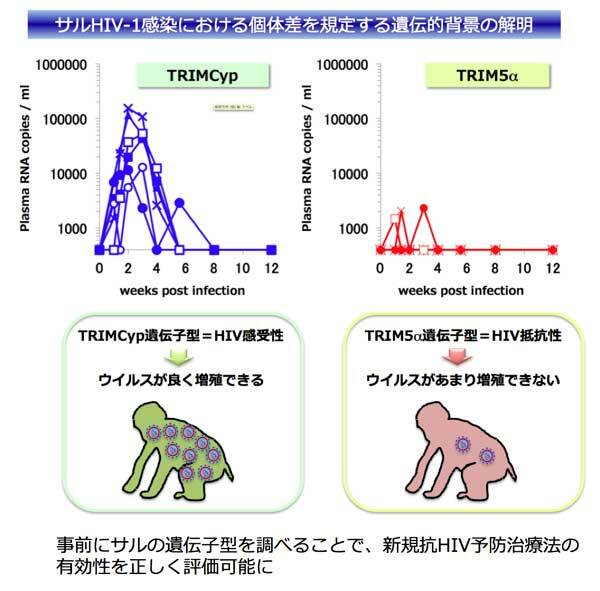 Especially, it is notable that the CMs having TRIMCyp, a variant allele of TRIM5, exhibit greater susceptibility to HIV-1mt infection as compared with the monkeys homozygous for TRIM5a, a wild-type allele. On the basis of our findings, it has become possible to identify the individual susceptibility by pre-screening of TRIM5 genotypes, which is invaluable for establishing a pre-clinical CM model of HIV-1mt infection. Our findings will also provide an important insight into the divergent susceptibility of macaque monkeys to HIV-1.